More fun with crushed Smarties! I think this is as far as I can go with the whole “Smarties”/school thing. 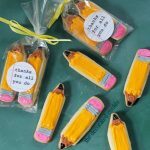 But methinks the kiddos will need some cheering up as school time approaches. 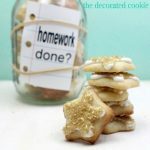 (I’ve already declared my personal joy at the start of school when I made these Smartie pants cookies.) 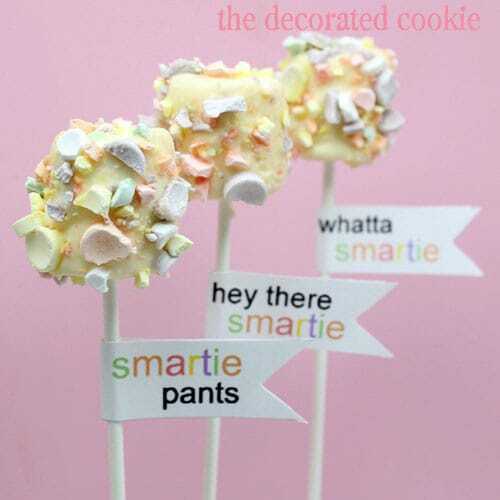 And as an extra bonus, I made you a printable for straw or lollipop stick flags so everyone will get the whole “Smarties”/school thing. 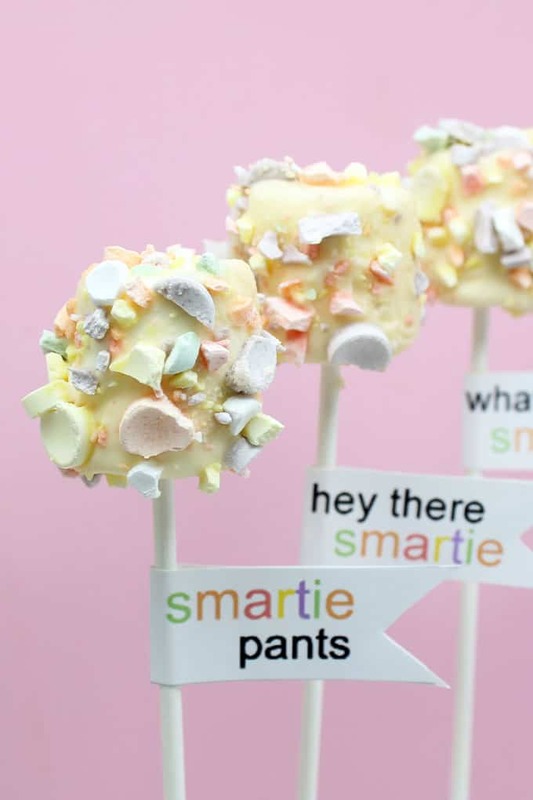 Just tell them these are back to school “Smarties” marshmallow pops. *Find the lollipop sticks, candy melts and Styrofoam block in the craft store. Find paper straws at specialty stores, such as the Layer Cake Shop. If using the flag printable, you’ll also need white letter-size cardstock or heavy paper, a color printer, scissors and a glue stick. Place a few rolls of unwrapped Smarties candy in a Ziploc and crush with a mallet, hammer or rolling pin. I put mine on a cutting board to save my counter. Set aside. 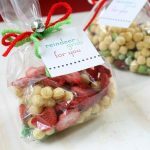 In a microwave-safe container (or on the stove-top in a double boiler), melt the candy melts according to the package directions. I usually work with one cup at a time, and microwave on 50% power for 1 1/2 minutes, then 30 second intervals until just melted, stirring well. TIP: Add 2 or 3 teaspoons of Crisco to the candy melts before nuking for easier dipping. 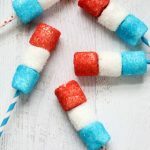 Skewer a marshmallow with a stick or straw and dip to coat in the melted candy melts. Gently tap off the excess and immediately coat with the crushed candy. Prop in a Styrofoam block until well set. 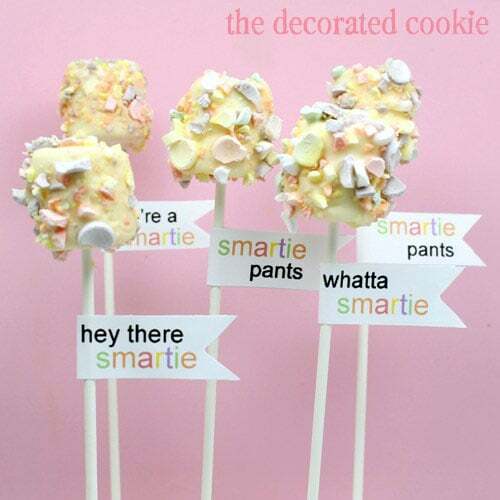 If desired, print out the Smartie flag printable on letter-size paper with a color printable. Cut out the flags, using the gray lines as a guide. For each flag, fold in half and cut a wedge at the end. Unfold and glue the entire underside of the flag. Wrap around the lollipop stick and press to seal. 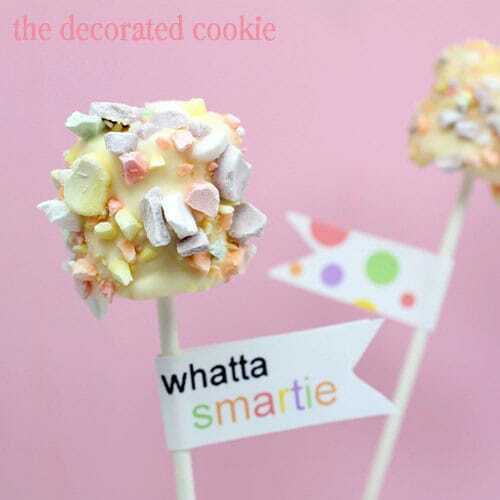 I really love smarties and all the ways you’re using them are too cute! So clever and so pretty at the same time! I love the cute label too! Love these, Meaghan. 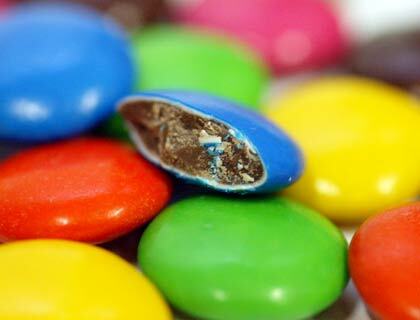 Here in the UK, Smarties are exactly the same as chocolate M&M’s. It’s weird to see the difference. Are US Smarties those chalky yet fizzy candy that gives a sweet fizzing sensation in your tongue? But not like popping candy. If so, I should be able to re-create them here as we have the same thing just under a different name. Ah, Lisa, those are Pop Rocks! Popular around 4th of July here. Smarties are also sort of chalky, but more like a solid chalky consistency, sweet and a little tart. But you could easily do these with any candy named “Smarties”! Lisa, here in Canada we have the chocolate Smarties too. I think the US Smarties are like what we call Rockets here in Canada. They are the rolls of fruit flavoured round candies that are about the circumference of a pea. They come in rolls about 5 centimetres long. Yep, that’s the same thing, owensmama! what are the sweets sticking on?